Eric Lamaze and Fine Lady 5. Photo by PSV Jean Morel. La Baule, France – Canada’s Eric Lamaze continued his winning form, scoring a second victory riding Fine Lady 5 at CSIO5* La Baule, France, this time in the €25,000 1.50m Prix S.C.H. La Baule – Cap Atlantique held Saturday, May 14. The win comes hot on the heels of the pair’s victory in Thursday’s €28,000 1.50m Prix FFE, where Lamaze bested a starting field of 64 entries. Riding Fine Lady 5, Lamaze stopped the clock in 68.20 seconds to take the win over Gudrun Patteet of Belgium with a time of 69.90 seconds riding Sea Coast Atlantic. On Saturday, Patteet would once again prove to be Lamaze’s closest competition. Of the 45 starters, eight posted a clear round over the track set by French course designer Frédéric Cottier to advance to the jump-off. Lamaze and Fine Lady 5 once again showcased their incredible turn of foot, nipping around the shortened jump-off course in a time of 33.85. Patteet, again aboard Sea Coast Atlantic, followed Lamaze in the jump-off order. While the Belgian rider opted to leave a stride out to the final fence, a wide oxer set in front of the ingate, her time of 34.94 seconds left Lamaze well ahead for the win. With the 2016 Olympic Games on the horizon, Lamaze has a difficult choice to make. 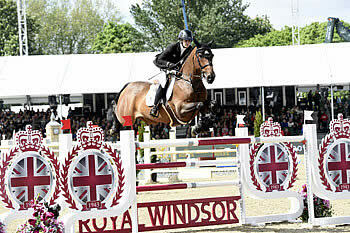 With several top mounts in his stable, the next two months will determine the 2008 Olympic Champion’s choice for Rio. Lamaze’s other Olympic hopefuls include his 2015 Pan American Games team gold medal partner, Coco Bongo, and Check Picobello Z, who will compete with Lamaze next week in the CSI5* Global Champions Tour in Madrid. On the final day of competition in La Baule, Lamaze will call on the newest addition to his string, Chacco Kid, for Sunday’s €200,000 CSIO5* Longines Grand Prix. Fellow Canadian Yann Candele of Caledon, ON is also competing at La Baule and will ride First Choice 15, owned by the Watermark Group, in Sunday’s finale. While Lamaze was representing Canada in France, fellow Artisan Farms rider Tiffany Foster of North Vancouver, BC was across the English channel competing at CSI4* Windsor in England. Like Lamaze, Foster was also part of an eight-horse jump-off on Saturday. Partnered with her season veteran Victor, a 14-year-old Dutch Warmblood gelding (Elmshorn x Grandeur) owned by Artisan Farms and Torrey Pines Stable, Foster produced a clear jump-off effort in a time of 33.46 seconds. In the end, Foster settled for second in the €55,000 1.55m King of Bahrain Stakes for The King’s Cup behind Kent Farrington of the United States, who stopped the clock in 31.86 seconds riding Creedence. Following La Baule, Lamaze travels to Madrid, Spain for the CSI5* Global Champions Tour running May 19-22. Then it’s on to CSIO5* Rome, Italy from May 26-29 where he and Foster will both compete as members of the Canadian Show Jumping Team in Nations’ Cup competition.